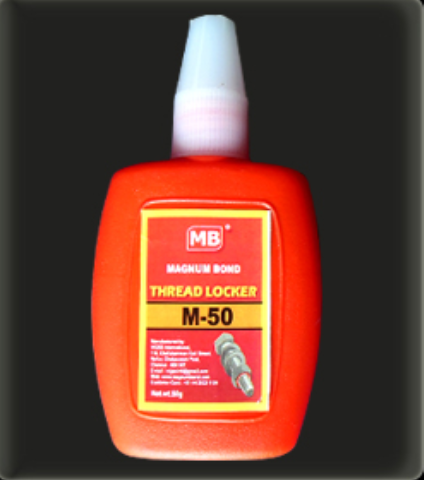 MAGNUMBOND Thread Locker is a one component anaerobic adhesive remains liquid when it is in contact with air. Curing does not start until the adhesive on the jointed parts come into contact with metal and is deprived of air. Widely used for locking bolts & nuts, screws, studs of various sizes. It replaces washers, nyloc nut etc. It allows fasteners to withstand vibration, impact loads and resist shocks. It prevents leakage and corrosion. Available in Low strength, Medium Strength and High Strength grades. Automobile, Machine assembly, Maintenance workshops in Industries. We at VIGSS Internationallook forward to carryout business with you either directly or indirectly, through the Quality Adhesive products you need. VIGSS International is a manufacturer of various adhesive products like Silicone Sealants, Cyanoacrylate (Super Glue), High Temperature RTV Gasket Makers and Self Adhesive Tapes in the brand “MAGNUM BOND” in Chennai. In addition a strong dedicated team of Technical and Marketing executives take care of customer needs. VIGSS International has valuable customers in Automobile sector, Construction, Engineering Industries, Plywood, Glass & Hardware markets. VIGSS International has established an excellent network of Distributors and Dealers in all major cities of South India and gearing up for all India operation and Export operation.